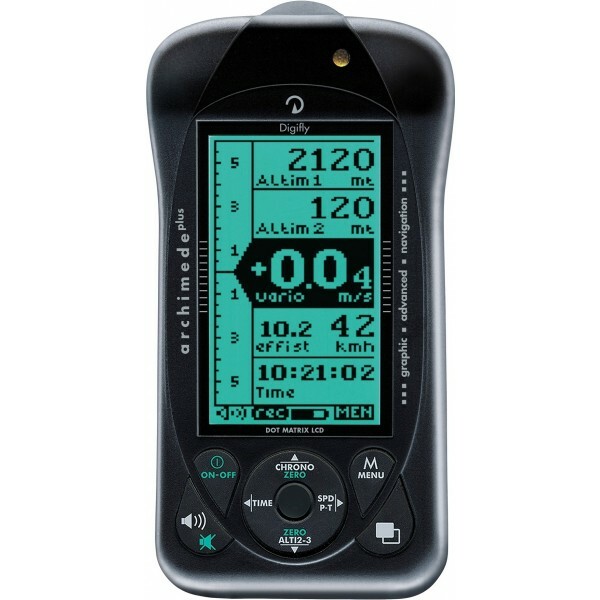 Another new model for 2008, the Digifly Archimede Plus replaces the Digifly Newton. The Archimede Plus is a completely new instrument with all the features of the Digifly Archimede but with 3 display screens, additional "Speed to Fly" functions, thermal sniffer/thermal centering function & multi flight data recorder with unique flight playback display mode. By buying this product you can collect up to 27 loyalty points. Your cart will total 27 points that can be converted into a voucher of 6 €. A new model for 2008, the Digifly Archimede Plus replaces the Digifly Newton. 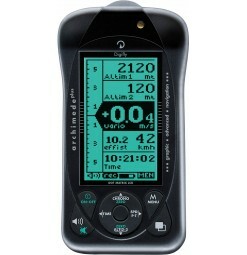 The Archimede Plus is a completely new instrument with all the features of the Digifly Archimede but with 3 display screens and the additional "Speed to Fly" functions, thermal sniffer/thermal centering function & multi flight data recorder with unique flight playback display mode. Pilots familiar with Digifly flight instruments love the sensitivity and speed of response of the our varios. All Digifly varios use "Intellivario Technology", a revolutionary system designed by Digifly which is based on the use of sophisticated digital filters to process information from the pressure sensor. This results in a a very sensitive vario which is also immune to radio interference. Uniquely, the Intellivario system is fully adjustable, allowing pilots to adjust the sensitivity their varios depending on the flying conditions. The Archimede Plus' buttons are clearly labeled, so users new to Digifly will quickly feel at home navigating the setup menus and the three main display screens on this new vario. The large, clear LCD screen also makes for easy observation in flight and the new high power audio on the front panel means that pilots will have no difficulties hearing the loud vario tones. Battery life on the Archimede Plus is excellent at over 200 hours on a single AA battery. The additional memory of the Archimede Plus provides a multi flight data logger of 100,000 data points. PC connectivity via the optional Digifly USB PC cable allows the download of your flight data to your PC for later analysis. The Archimede Plus' software can also be updated via the optional USB PC cable allowing you to keep your flight instrument right up to date with the latest software improvements from Digifly. There is also extra peace of mind with an extended 3 year warranty.